Darryl Johnson Jr., Marquell Cartwright, Lamar Raynard and others try to impress NFL scouts at NCAT pro day. GREENSBORO, NC- North Carolina A&T has been producing NFL players steadily in recent years and its looking to do it again for the fourth year in a row. 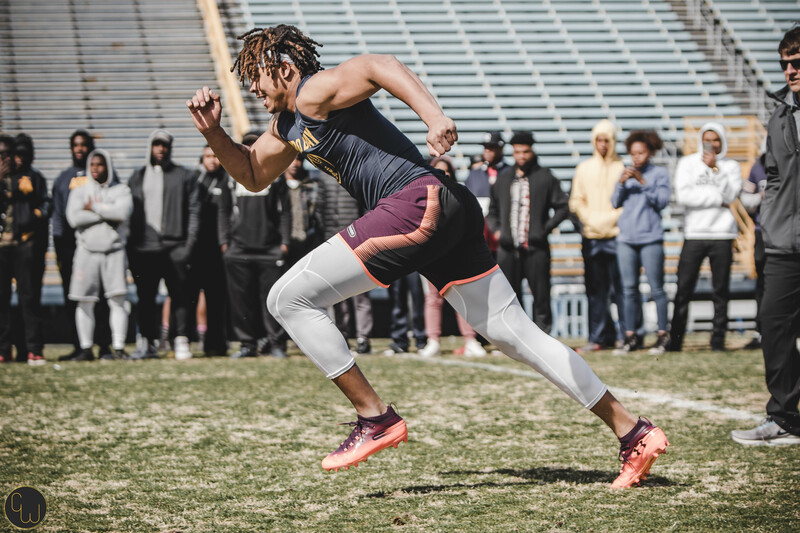 There were plenty of scouts in attendance for A&T’s Pro Day such as the Carolina Panthers, Chicago Bears and the Oakland Raiders to name a few. The Aggies had 11 players in total representing, including All-MEAC quarterback and running back duo Lamar Raynard and Marquell Cartwright. If drafted, Cartwright would become the third running back to be drafted out of A&T and Raynard would become the first quarterback to be drafted. Other participants were WR Malik Wilson, DB Timadre Abram, S Jamaal Darden, DE Sam Blue Jr., DL Julian McKnight, TE Leroy Hill, OL Micah Shaw, and OL Breontae Matthews. Darryl Johnson Jr. was the standout, however, after he decided to forgo his senior season to enter the NFL draft. The edge rusher had a solid Pro Day, running an unofficial 4.79 at 6 foot 6 and 253 lbs. He also had a 32 1/2 vertical jump, a 9’ 4’’ broad jump, and performed 20 bench reps.
Darryl Johnson Jr. doing the vertical jump. The NFL draft will air April 25th, 2019. The last two years have seen Tarik Cohen drafted by the Chicago Bears and Brandon Parker picked by the Oakland Raiders. But despite that stellar record for producing talent and the team’s success, media coverage was sparse compared to the NFL scouts who are well aware that there is talent at A&T, in the MEAC and at HBCUs overall. JSU has a season full of Classics and big matchups.